The fireplace is a wood block from your standard craft store with a plastic case filled with sticks on top. The wood seating was a gift from my spouse--came with the pool from an earlier post. 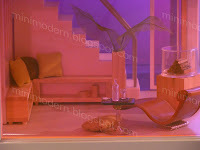 The pillows are from the Kaleidoscope House accessories, Fisher Price and Mighty World. The leather chaise is from Paris Renfroe Design. The tall wood planter is from Plan Toys. The drink accessories are from AG Minis and Mattel. Oh, and who am I kidding?--the entire Kaleidoscope House is one big sunroom. I just don't have a name for this post. How awesome! I always thought the pool was part of the 360 house. I wish I knew who made them. I know I will come across them at some random time. As soon as I find them, I'll post. BTW, when are you gonna blog your world?? I actually just started my new post (new year's res and all that). 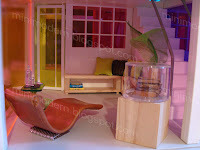 I actually wanted to ask you whether I could mention your blog, seeing as how it was yours that really convinced me that doing a modern dollhouse was viable. Are you sure you want to ruin the first impression of your blog by mentioning this crappy one??? ha ha! It's nice to see the Paris Renfroe chaise in a setting - it's so beautiful on its own, but it works in the room, too. The thing about short naps is... they're still naps. Smart of you to put the dollhouse ahead of the dishwasher or bills or whatever else might have been on the list. Natalie....will email you shortly at address MC kindly provided...hope I can take you up on the Starbucks mini meeting. MC: I have that same chaise and it is great! Just the right proportions and it looks sooo realistic. I would recomend Paris' work to all reading this. nice job! i'm fascinated with your blog, good work! Really cool! I also have the Kaleidoscope House and enjoy it so much as an ongoing decorating project! Another K house has popped up on Ebay. I wrote about it today on my blog - $1549 starting bid!! !